The list of things to do in Riga encompasses more than any traveler can do in a day, a week or more. So what do you do if you only have a day to see Riga before moving on to your next travel destination? Plan carefully and see the highlights. Here’s what you can do with a day in Riga, Latvia. Old Town is where many of Riga’s must-see sights are located. Here, you’ll see the House of Blackheads on Town Hall Square, Riga Church, the remains of Riga’s defensive structures, and St.
Peter’s Church. The lookout tower of St. Peter’s Church is excellent for seeing Riga from above, which is a good way to say you have seen a lot of Riga, including the River Daugava and the Moscow District, very quickly. An excursion to see the main sights of Old Town Riga will only take a couple of hours, provided you have a good map and a decent sense of direction. However, it is easy to get turned around in Old Town, so if you want to see specific sights, mark them out and plan your path through the medieval streets. Along the way, be sure to take in the architecture and open spaces of the old town. You’ll see a variety of styles and may catch fairs or performances on squares. After your tour of the Old Town, get lunch either in the historic district or close to the Art Nouveau district, where you’ll be going next. Restaurants in the tourist areas unquestionably charge higher prices than elsewhere in Riga, and if you don’t have a lot of time, it may be difficult to find a restaurant that caters to a budget. However, if you’re in the mood for well-priced Latvian food, visit Folk Klub Ala, a Riga institution. Its new address is at Peldu 19, just south of Old Town Square. Sausages, potatoes, ham, and soups are only some of the menu items that will fill you up quickly on traditional cuisine. It would be a shame to visit Riga without seeing some of its most remarkable examples of Art Nouveau architecture. Though Riga has over 800 existing Art Nouveau buildings, the most concentrated collection of them can be found in the area of Elizabetes and Alberta streets. In fact, for a quick look, Alberta Street is your best bet, while Elizabetes will require more time dedication. 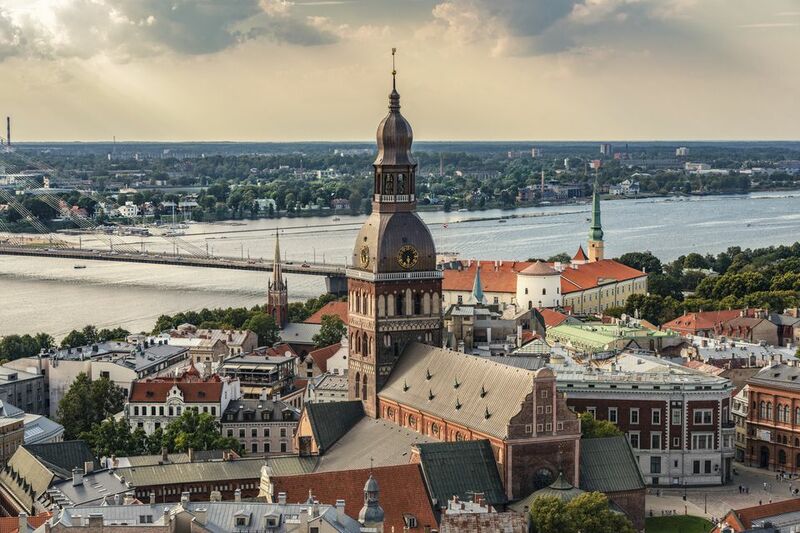 Spend an hour or more viewing these historic treasures that make Riga so distinct and offer such a strong impression to visitors from all around the world. If you’re tired from walking, consider taking a rest to try Riga’s most famous drink, Black Balsam. This herbal alcoholic beverage packs a strong punch and leaves the majority of first-time tasters reeling from its strange flavor, black color, strength of spirit, or all three. Any bar or restaurant in Riga sells Black Balsam in shots or as part of a cocktail. If you are departing Riga from train or bus station, check out the Central Market, located nearby, if you have time. Five hangars and outdoor stalls sell a variety of Latvian and international produce, from seafood to cheeses, to meats, to fruits and vegetables. The Central Market is an intriguing combination of sights and smells and is great for people-watching, too. Here you can pick up a last-minute snack or souvenir to remind you of your brief stay in the Latvian capital city.